Interim Relief (IR) 20% announced for AP Employees and Teachers. 20% will be calculated on the Basic Pay of Employee and this 20% IR will be added in Earnings sections in pay bill. 20% Table has given below to understand the increase in salary. 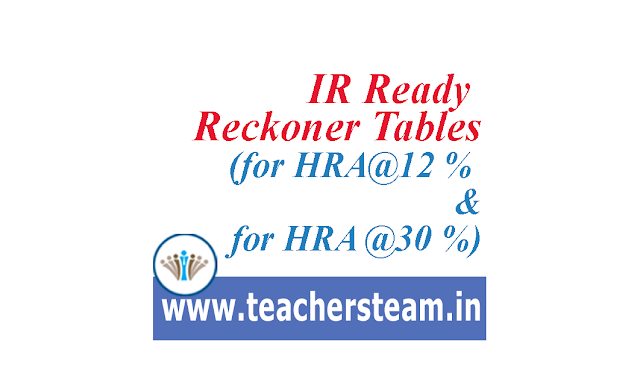 Employees can download this table and they can check their IR Amount from the IR Ready Reckoner Table. In Telangana Pay Revision Committee has been constituted vide GO.86 Dt:18-05-2018 issued by the Government of Telangana, a 3 member committee has been constituted study on pay scales revision. The Interim Relief may be announced shortly by the state Government. in view of the present prevailing senario of political situation we can expect the IR Announcement from the government. Interim Relief here a table has been prepared to ckeck easily how much amount we will get for various percentages. Interim Relief will be calculated on the employee Basic Pay.